SOREL rated: -25° fahrenheit / -32° Celsius. A snug, lightweight lace-up with a close-to-the foot fit and soft, faux fur lining. This waterproof performance boot features 200g of insulation, a removable EVA footbed, and multi-directional outsole lugs for enhanced traction in slippery conditions. 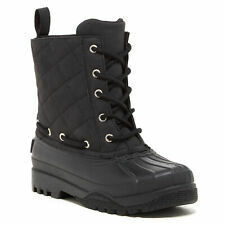 This a fashion boot, but not really made for deep snow. Fashion Sneakers. Boot Length: Knee High Boots. Toe Style: Closed Toe. Boot Opening Circumference: 11.5. Style: Fashion Boots. Heel Type: None. Closure Type: Pull On. These shoes typically show a little more wear in their soles and may have blemishes such as scuffs and/ or wrinkles. Condition is Pre-owned and I’m very good condition. Women’s NEW Camel Colored Fur Lined Boots Size 40. Shipped with USPS Priority Mail. FREE SHIPPING. Gola Snow Winter Insulated Boots Waterproof US 9 - 10. Shipped with USPS Priority Mail.